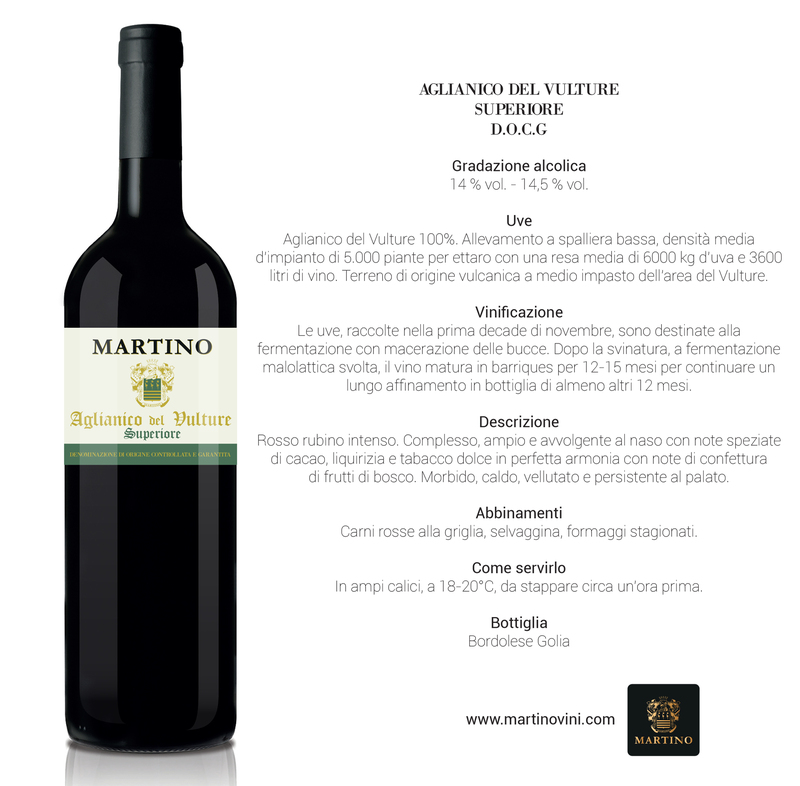 Grapes:100% Aglianico del Vulture. Low espalier training system, average plant density of 5000 vines per hectare with an average yield of 6000 kg of grapes and 3600 liters of wine. Medium texture volcanic origins soil of the Vulture area. Winemaking: The grapes, harvested in the first decade of November, are put to ferment with controlled temperature maceration on the skins for about 20 days. After devatting, once the malolactic fermentation is carried out in underground tanks, the wine ages in barriques for 12-15 months to be followed by a long bottle aging of at least 12 months. Description: Intense ruby red. Complex, wide and enveloping bouquet with spicy notes of cocoa, vanilla, liquorice, sweet tobacco in perfect harmony with hints of fruit of the forest jam. Soft, warm, velvety and persistent on the palate. How to serve it:In wide long-stemmed glass, at 18-20°C, to be uncorked one hour before serving.